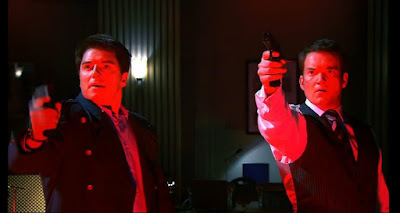 Torchwood: Children of Earth Day Four -- Jack and Ianto stand up to the 4-5-6. I'm still reeling from tonight's installment of Torchwood: Children of Earth. It's a no-win situation with the 4-5-6, bargaining children for the safety of the planet. And then there's Jack and Ianto, two lone figures standing up for what they believe in--for what Ianto has convinced Jack is the right thing to do. *SPOILER ALERT* Don't scroll down if you haven't yet seen the fourth episode of Torchwood: Children of Earth. You can read my recap of Day Four here. 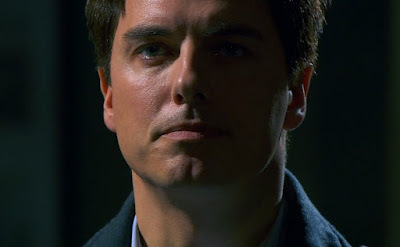 *CLICK* all Torchwood pics for larger versions. Johnson's not so certain of her mission, now that she sees what the government's been up to. Jack is determined to scare the 4-5-6 off. Ianto believes in what they're doing, and believes in Jack. 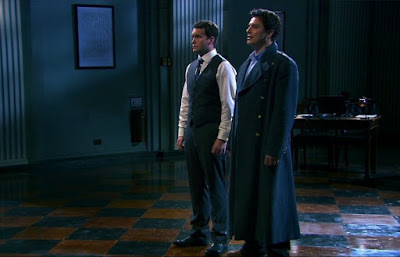 Once the virus is released, Jack and Ianto try to take the 4-5-6 with them. But the glass is bulletproof. Jack holds a dying Ianto, as Gwen holds the dying Clement. Turns out even the Ice Queen has a heart. Ianto tells Jack he loves him. 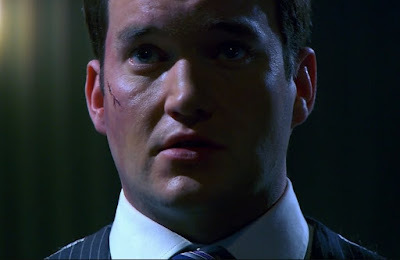 Jack promises Ianto he'll never forget him. They are helpless before the 4-5-6. 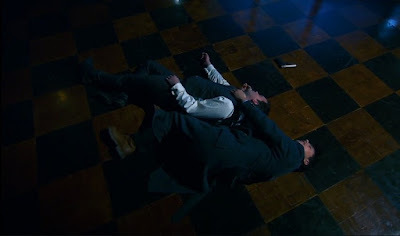 Jack gives Ianto one final kiss. The brave stand-off is over. Tomorrow night we find out what happens to Torchwood and to the Children of the Earth. Tune in to BBC Americat at 9/8c. PHOTOS: John Barrowman as Captain Jack Harkness, Gareth David-Lloyd as Ianto Jones, Eve Myles as Gwen Cooper, Liz May Brice as Johnson, and Paul Copley as Clement McDonald, Torchwood: Children of Earth Day Four screencaps, c2009 BBC Wales, BBC America.